Mawalan Marika was head of the Rirratjingu clan from North East Arnhem Land. He is one of the greatest bark painters and carvers of his time. 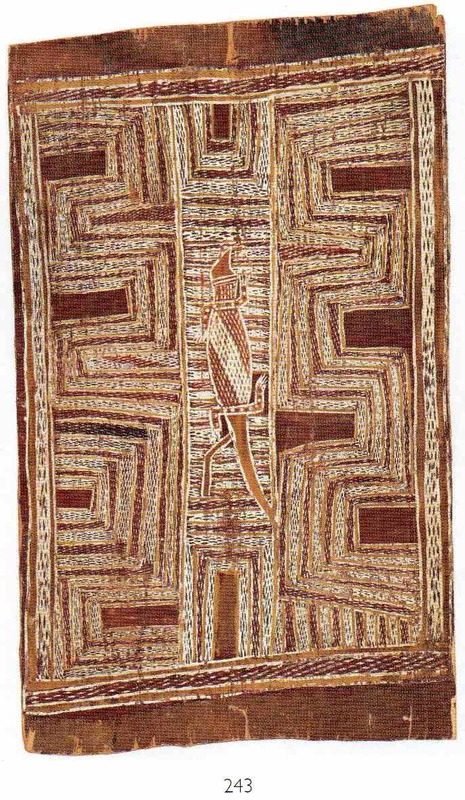 The aim of this article is to assist readers in identifying if their bark painting is by Mawalan Marika. It compares examples of his work. Mawalan Marika bark paintings are in a North East Arnhem land using traditional ochres. If you have a Mawalan Marika bark painting or sculpture to sell please contact me. If you want to know what your Bark painting is worth to me please feel free to send me a Jpeg. I would love to see it. Mawalan covered bark paintings with delicate rarrk (cross hatching). This rarrk separated into inter-related sections by straight and diagonal lines. They contain motifs of figures totemic animals and geometric designs. In general Mawalan had a love for yellow ochre. There is a striking contrast between his ability to do incredibly detailed Rarrk and the simplicity of his figures. His earlier barks are rarrk clan patterns with few or no figurative elements. Due to the market wanting figurative work his later paintings contain larger and more figures. His bark paintings that convey sacred stories and ceremonies tend to be the most valuable. Mawalan paintings that are physically the most complex being more valuable than simpler works. Mawalan was a revolutionary artist for his time. He embraced new techniques and breaking away from some of the constricting customary norms. 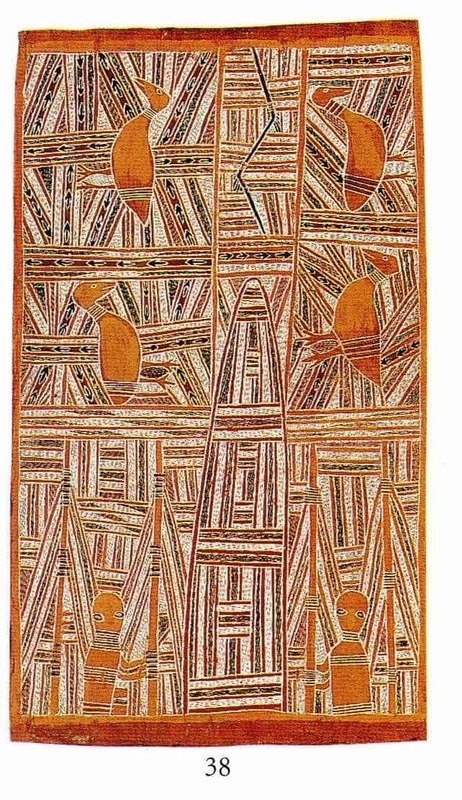 Some of his later paintings have an almost central Arnhem Land feel with no rarrk at all. His later paintings also use dotting techniques not found in his earlier more traditional works. 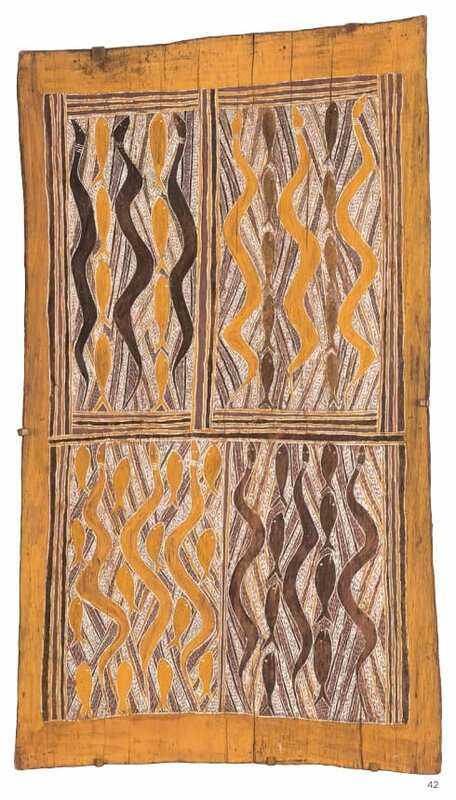 He along with Munggurrawuy Yunupingu inventing episodic or panel style in bark paintings. Although known as a Bark Painter Mawalan created some of the greatest painted sculpture in Arnhem Land. These figures have great clarity and form. They are often superbly painted and finished with feather attachments. Aboriginal Sculptures are very collectible in their own right. He was amongst the leaders in the fight for Aboriginal land rights in the 1960’s and 1970’s. He played an important role in the production of the ‘Bark Petition’ to the Commonwealth Parliament. This bark petition was effectively a testament to their claim over the land and consequent right to negotiate the terms of mining on it. He was one of the first elders to break from custom and introduce women to painting on bark in the 1960’s. He taught his two oldest daughters Banduk and Dhuwarrwarr to paint their family designs.